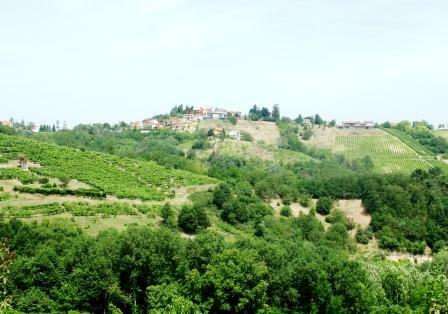 Lombardia has a number of so-called lesser appellations, and Botticino, a red from the Alpine foothills to the west of Brescia (mid-way between Brescia and Lake Garda), is one of them. To be honest, the major reason Botticino is obscure is the volume produced; were the appellation larger, and more wine available, it would be much better known. 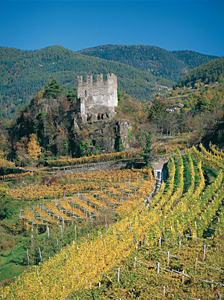 The climate and topography of the Botticino appellation resemble those of Piemonte, but the winemakers have been wise enough not to tangle with Nebbiolo, which is extraordinarily picky regarding where it is planted, and instead work with a mixture of at least 30% Barbera, at least 20% Marzemino, at least 10% each Sangiovese and Schiava Gentile, and up to 10% other non-aromatic red varietals permitted by the Province of Brescia. The wine must be fermented and bottled locally. 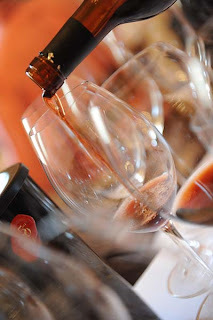 Botticino D'Annata cannot be released until the June following the harvest, while Botticino Riserva must age for at least a year, and cannot be released until the second November after the harvest. Minimum Alcohol contents are 11% for the vino d'Annata and 12% for the Riserva. 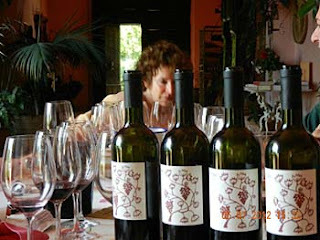 This year the Azienda Franzoni sent me three wines to taste. Pale cherry ruby with brilliant reflections and cherry rim. The bouquet is fresh and vinous, with lively sour berry fruit -- cherry and some currants, with other dark wild fruit as well -- supported by bitter underbrush and some wet tree bark, with slight graphite shavings and a fair amount of alcoholic warmth. Scrappy, and rather tomboyish. On the palate it's bright, with lively sour cherry acidity that has some graphite laced bitterness to it, and some underlying minerality, with slight cedar as well, and tannins that have a savory burr and flow into a long rather sour finish. It's as brash on the palate as it was on the nose, and if you're coming from softer smoother international-style wines you'll think you have landed on a different planet. But it is welcoming, leaving the palate clean, and is the sort of wine that will work very well with mixed grilled meats or even fried meats and vegetables. F you're more traditionally minded and like this style you will enjoy it considerably. Deep cherry ruby with black cherry reflections and rim paling to ruby. No real signs of almandine yet. The bouquet is elegant, and richer than the Ronco's, with more seductive berry fruit laced with slight hints of cedar, and a little less acidity -- where the Ronco was brash, this is slightly more curvy, the tomboy grown up as it were. Quite pleasant to sniff. On the palate it's deft, with fairly rich slightly balsamic sour red berry fruit supported by moderate rather balsamic acidity and by tannins that have wet leafy underbrush accents and flow into a clean underbrush laced finish. It's more refined that the Ronco, but cut from the same cloth, with an interplay sourness and grape tannins that is much more traditional than international, and it will work nicely with grilled meats (less fatty cuts than the Ronco; I would think about a steak) or light stews that aren't too spicy. It is still quite young, and will age nicely for another 2-3 years, though its current freshness is also quite enjoyable. Deep black cherry ruby with black reflections and cherry rim that has slight almandine accents; the wine is 8 years old and the colors are starting to shift. The bouquet is deft, with red berry fruit supported by slight cedar with hints of almonds and some savory notes, and also slight nose tingling spice, with some alcohol as well. On the palate it's medium bodied, with rich sour cherry fruit that has fairly bright raspberry acidity -- the Barbera in the blend -- supported by deft rather mineral acidity with some graphite shaving bitterness, and savory accents that flow into a long rather savory sour berry fruit finish. Very nice, with beautiful balance in a fairly traditional key; it again revolves around the interplay between fruit and acidity, while the tannins support and provide backbone without distracting cedar or other influences. Very pleasant, and if you like this style you will enjoy it very much; it is ready now, but will also age nicely for another three to five years at least, assuming you have the patience. I'm not sure I would. 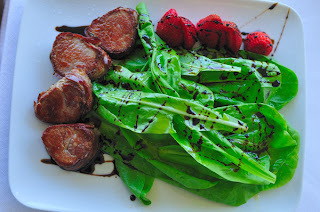 In terms of accompaniments, succulent not too fatty red meats, either roasted or off the grill. A last thing to note: for their more important wines, Botticino's wineries employ a bottle called a Deformata Piemonte, which resembles an Albeisa-style bottle, but has a twist in it that throws it off-center. Looks a bit odd, but fits the hand very well and is easy to pour from. 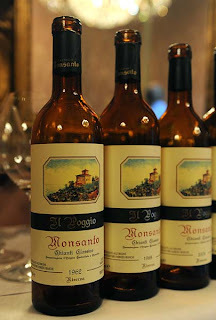 More about Botticino, from Roberto Giuliani's fantastic writeup of Italian appellations. Lying on the bed of my room, looking though the shadows to the bit of mountain I could see from my window, A single thought ran through my head. And had since morning, when, as I waited for breakfast, I had examined the old pictures on the walls. And seen him: Uncle Luigi. It was a shot from after the war, in black and white, a family picture with simple people, farmers. But Luigi (they had told me that was his name) stood out: Dark lively eyes, hair combed back, and a naïve smile that hid a worried expression. Quite worried, almost anguished. "He was a bit 'strange,'" remembers his niece. Once, to rebel against his grandmother's religious fervor, which dominated the house, he took brush and paint and wrote, on the back wall of the house, where there are now the four rooms of the agriturismo, "This is the Devil's House." And then he left the valley with the (quite believable) excuse that there was no work to be had. The best he came up with was enrolment in the French Foreign Legion, which took him to the hells of Indochina and Algeria, where he looked death in the face. Experiences that, after his discharge, provided him with an inexhaustible well of tales with which to entertain nephews and nieces the few times he returned to visit his relatives. But not even retirement led him to return to the valley; he lived and died, alone as he always had been, in a town in southern France where the Government had homes for discharged soldiers. Who knows what secret, if any, Luigi kept in his breast? You are doubtless wondering where this is going, and what question I had as I lay on my bed. Two questions, actually. First, what the Val di Cembra was like seventy years ago. Second, if there is now a good reason to want to settle there. And despite my wonderings, I couldn't come up with an answer. The Val di Cembra is a valley of Trentino, deep and rural. It's too low to be mountainous, too high to be hilly, with thick forests and steep slopes. A series of towns on the slopes, and a pair of porphyry quarries that are an insult to the eyes but saved the local economy. 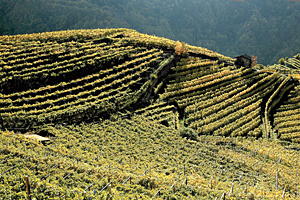 Vineyards everywhere, perched on the cliffsides, climbing the gullies, set into terraces unaccessible to tractors. 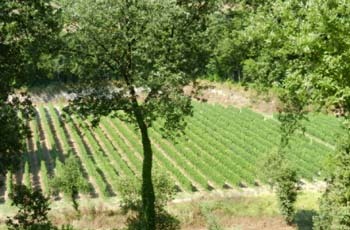 Now they're almost all planted to Muller Thurgau (for the past 25 years Cembra has hosted a fair dedicated to the wine), which replaced the glorious Schiava 30 years ago. 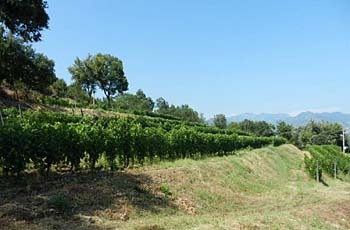 Vineyards dricen into the mountains, at altitudes up to 900 meters, rurality in the breezes. Further up there's the Lago di Cembra. It freezes in winter, and when we were kids we'd go skating. Then, in the 70s, a Dutchman (who could perhaps answer my second question) appeared and told the startled villagers they could play bocce on the ice: Curling had come to Cembra. What does this have to do with anything? Quite a bit. Another ten years go by, and a local girl marries a Swiss man. Not just any Swiss man, but a curling champion. To cut to the quick, a school opens, and then a team, and then another. And now there are six, including the national champions: Cembra, and its valley, are the capital of Italian Curling. But this may not be a good reason to come to the Val di Cembra. Nor even Muller Thurgau (though I have had some that were quite interesting and even unexpected, including Pilzer's grappas and distillates). Perhaps there isn't a good reason to come up here, and this could be the answer to my question. However, I came to a different conclusion. I got up and opened the window. I enjoyed the vineyards draped over the slopes of the narrow valley. I went out under the pergola, and chatted with the owners of the house, Tiziana and Rosa, and enjoyed the homey pie, the cheeses and the cold cuts, while listening to the brook and sensing the Dolomites in the distance. And told myself that I'd be back soon, precisely because, despite the apparent lack of a good reason to stay there were many. Uncle Luigi did differently, but he was born there. Who knows, he might have been good at curling. Non-attributed photos courtesy Cembra Mostra Vini Muller Thurgau. Silvia Imparato's Adventure began precisely 20 years ago, on a hill near Salerno, at the feet of the Piacentini, the mountains of the Massiccio del Terminio that sit astride the Province of Avellino: She began to make wine with her Roman friends in the old family home out in the country. It seem like, and is, a standard 1990s story, but with one important difference: It wasn't concocted by a marketing agency. Because this adventure started in an area that was at the time unknown in terms of wine. The first Vini D'Italia Guide published in 1988 mentioned just 7 wineries. Now a guide worth its salt lists at least 90. There were Mastroberardino's wines, especially the whites that were released by Christmas to be drunk on New Year's Eve. And the whites of Ischia, the reds from Moio, and Mondragone, and a tremendous volume of bulk wine made by the cooperatives and the wineries in the outskirts of Naples. Montevetrano played a precise role, which is obvious today but was revolutionary in 1994: that in the South, and in Campania, it was possible to make noteworthy wines capable of holding their on in the world markets. At the time the lethargy Campanian wine had fallen into before the war came to an end, with a reawakening of enthusiasm, success, and development. Much as was happening in other parts of Italy, but here the reawakening affected an area with great indigenous wines that was beset by all manner of problems. As always happens, those who lead are contested. And so it was here, especially with the rise of Wine Criticism 2.0, which shifted its attention to other wineries, in part as a response to the "official" wine press that published on paper, and in part because everyone wanted to discover something new. Over the years Silvia Imparato has produced great bottles that hold indefinitely, ignoring fashion and trend with classy assurance. In these 20 years the world has changed completely, while Montevetrano has become a classic. A classic built upon real farming, organic farming that plays out the lives that go into the wine. A history that transcends the boring barriques/no barriques and indigenous/international arguments, because it was born the only tradition in the Salento was jugs of bulk wine made with every varietal one could name, including Piemontese Barbera. Now the traits identifying Cabernet Sauvignon, Merlot, and Aglianico are easy to recognize. On this rich hillside was old the tale of a viticulture that was able to turn the tables on stereotypes and establish country life as an improvement with respect to life in the cities. The 2010 is Good, and will be there to celebrate Montevetrano's 40th anniversary alongside the still extraordinarily fresh 1992. This year marks the 50th anniversary of Fabrizio Bianchi's decision to try something that at the time was a radical innovation for Chianti Classico: Making a wine from a single vineyard. It was Chianti Classico's first, and is from the vineyard that still yields the cuttings for all of Castello di Monsanto's other vineyards. Not that one would necessarily recognize the Il Poggio vineyard if one were to go back in time: It was 2.8 hectares then (as opposed to the current 5), but more importantly it was a vigneto promiscuo, farmed according to the old tenant farmer tradition that dictated one plant other crops between the rows of vines, and olive and fruit trees too. But the grapes were good, and Fabrizio therefore fermented them according to local custom, which dictated one throw the bunches, stems and all, into chestnut vats -- he admits to having had doubts, because his relatives in Piemonte did things differently, but did things the Tuscan way, with punch-downs and pumpovers, and also included the white grapes traditionally used. The aging was for 4 years in large (30 hectoliter) chestnut casks because that's what they had, and the results were good, good enough that he decided to continue, and one of the things he did was replant the vineayrd just to vine. 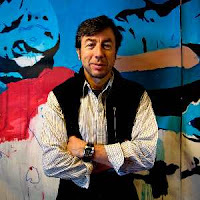 He also began to innovate; by 1968 he had stopped fermenting whole bunches with their stems, was fermenting (with punchdowns and pumpovers) in temperature controlled steel, and had also decided to work only with the red grapes of the blend, primarily Sangiovese, with about 10% Canaiolo and some Colorino. Aging was still for 4 years, in chestnut casks. But he was thinking about that too, and by the time 1974 rolled around was just pumping over in the fermentation tanks, and had decided to age the wine in 50 hectoliter Slavonian oak casks, for a little less -- 3 1/2 years. And so things continued through 1979, 1985, and 1988. More innovation with the 1995 vintage, however; 40% of the wine aged in barriques and the remainder in 50 hectoliter Slavonian oak casks, all for 18 months, and then spent another 6 months in cask after assembly. Barriques made further headway in 1999, when the wine was entirely barrique aged, in a mixture of new and used barriques, and rested in steel for 3 months after assembly. Things stayed the same in 2001, while in the 2008 vintage we finished with, the wine was aged in a mixture of barriques and tonneaux. Brownish garnet with Moroccan leather reflections and rim, which pales to orange. The bouquet is powerful, and though clearly mature has a pleasant rich freshness to it, with spice and leaf tobacco mingled with some leather and dried roses, and considerable underlying slightly balsamic sea salt, and as it opens some hints of lathered horse as well. Something one can meditate about. On the palate it's fresh, with bright sour prune fruit supported by sour prune acidity and some leathery accents, and silky tannins that gain direction from bright prune acidity that keeps the wine very much on its toes, and flows into a long tart finish. Very impressive, with acidity that is frankly scrappy -- it was made with white grapes, and the entire bunches went into the tini -- and of a sort that will guarantee many more years of life to the wine. Beautiful, and a child of a different winemaking technique, one that was more approximate but could be sublime when everything fell into place, and that I miss. Here they destemmed the grapes for the first time. Slightly duskier tawny garnet ruby with brownish reflections and Moroccan leather rim. The bouquet is more mature than the 62's with saddle leather and some spice with slight dried flowers, some savory notes, and fairly intense chestnut leaves as well. On the palate it's ample, with fairly rich savory sour cherry fruit supported by floral notes and pleasant savory accents, and flows into a long clean savory sour cherry finish with slight leathery underpinning. 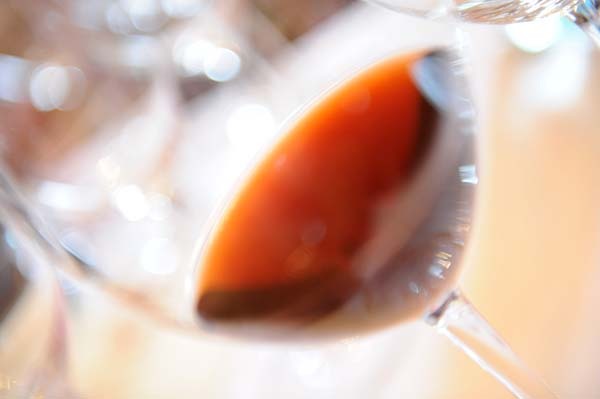 The tannins are quite smooth, and silkier than the 62's, and the wine as a while is more delicate than its older cousin, and this is because of the destemming, which removes a degree of scrappiness. The wine is very much alive, however. Just a touch more genteel. Both the 62 and the 68 display terrific austerity. Lively brownish almandine ruby with black reflections and almandine rim paling to orange. The bouquet is elegant, with dried flowers and some savory notes, and some minerality mingled with struck granite, and fairly intense saddle leather. It's not quite as fruity on the nose as the older vintages, especially the first. On the palate it's ample and smooth, with rich cherry fruit supported by bright acidity and by tannins that are smoother, and reveal the influence of oak as opposed to the chestnut of the first two vintages. It's extremely elegant, displaying great depth, and does have that acidic imprint, but is I think a bit more mature than the 68, and to a greater degree than the 62, because the acidity isn't as brash. Very pleasant, and a wine that has a great deal to say even now. Beautiful continuity from vintage to vintage; they're very much cut from the same cloth. Brownish almandine with deep black almandine reflections and almandine rim paling to orange. The bouquet is deft, with balsamic accents and spice mingled with berry fruit and some dried flowers, and some mineral spice and acidity as well. On the palate it's bright, with fairly rich sour berry fruit that has a leathery underpinning and some vegetal notes, and flows into a long rich leather and balsam laced sour cherry finish. Very much alive, and graceful, in a slightly lighter key than some of the others. It has a lot to say and is quite engaging in a slightly tomboyish way, and this is not something one expects of a wine that is more than 30 years old. Terrific freshness. Deep black almandine ruby with brownish black reflections and almandine rim. The bouquet is elegant, with balsamic accents mingled with spice and leather, and supported by berry fruit and hints of shellac; it's tertiary but quite fresh and quite elegant. On the palate it's beautiful, with rich bright red cherry fruit supported by slight sweetness from hints of residual sugar that are a result of the length of the summer, and supported by smooth sweet tannins that flow into a long slightly sweet prune finish with some savory accents. Quite pleasant, and shows an influence of the vintage that other vintages don't, in the sweetness and the sugars, while the acidity, which is present, isn't quite as marked. Impressive in any case; with respect to the 79 it is more approachable, and the sort of wine that one could serve to a wine loving friend who drinks wines to enjoy them, not to ponder them. This said, even a wine geek will find things to enjoy. Deep black almandine with black reflections and almandine rim. The bouquet is elegant, with savory red berry fruit supported by slight balsamic accents and some savory notes. It gives an impression of having been a warmer summer; there are also fresh prune accents, and some Moroccan leather. On the palate it's fresh, with elegant sour prune fruit supported by slightly leathery tannins and moderate acidity -- there's less than in the 85 -- that flow into a fairly long rather savory balsamic finish that has a dry tannic underpinning that brings chestnut leaves to mind though the wine is in oak, and also reveals some pencil shaving bitterness that is oak related. Rambling here. The wine is in any case pleasant, though the acidity is a little less marked than the previous vintages, and I find it to be somewhat lacking in this respect. Roundness and smoothness steps in for acidity. Deep black almandine with black almandine reflections and almandine rim. The bouquet is delicate, with leathery notes and some balsamic accents mingled with leaf tobacco, and some warm mineral spice mingled with savory notes. Pleasant in a more ethereal key, and this is in keeping with the vintage, which was cooler. On the palate it's bright, with lively sour cherry prune fruit supported by considerable prune acidity that echoes the older wines, and this is because of the coolness of the vintage, while the tannins are smooth, but do have a slight burr, and flow into a long sour berry fruit finish. The acidity is back! And the wine is very enjoyable in a graceful scrappy key, an odd combination, but it works. This is, Fabrizio says, destined to be the longest lived wine Monsanto has ever made. The wine marks a change of sorts, it's more towards ruby with slight hints of garnet in the rim, but less of the orange cast and reflections that the older wines displayed. The nose also changes, with rich red berry fruit supported by dusky leathery accents and brooding shadow, menthol, and woodsy herbs; a fellow taster says it reminds him of a Barolo, and he has a point. Very impressive, but different. On the palate it's ample and rich, with powerful cherry fruit supported by deft slightly leathery acidity and by tannins that have a slight burr to them, and flow into a long rather tannic finish with some leathery accents and hints of Moroccan leather that echo the older wines. Beautiful and extremely fresh; it's still very young, and though one could open a bottle now if one had one, if one had more than a couple one would want to set most of them aside. Very fine, and has a long ways to go; a fellow taster says that it's the wine everyone will agree on and find something to enjoy. And he's right. Deep black cherry ruby with black reflections and cherry rim that has slight almandine accents. The bouquet is young, and intense, with berry fruit and spice mingled with savory notes and sea salt, and also slight shellac. It's not still coming together, but is still quite young. On the palate it's ample, with rich cherry fruit supported by bright berry fruit acidity, and by smooth sweet tannins that have a fairly rich oaky component and flow into a fairly long berry fruit finish. It's quite elegant, and much more modern in style, with a richness and ripeness of fruit and a smoothness that the older wines don't display as much, while there is also a more pronounced alcoholic warmth. It's welcoming, and elegant now, but how it will be when it's the age of the older wines is something to confirm. 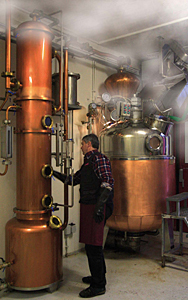 It's more modern in style, and this is in part the vintage, but may also be changes in winemaking. Lively cherry ruby with cherry rim paling to white. Fresh, and very young on the nose,with ith lively cherry fruit supported by some dusky black cherry sweetness, and by moderate acidity. Youth in a glass. On the palate it's quite pleasant, but again quite young, with beight cherry and forest berry fruit supported by lively berry fruit acidity and by tannins that lay a dusty burr over the tongue and flow into a bright fairly tart finish. The acidity is there, hearkening back to some of the older vintages, and it has a pleasing vibrancy to it that I didn't note as much in the 01 or the 99; it's very young, and very fresh, and displays great potential. A fellow taster says it's a return to the past, and in some ways it is, though we'll have to taste several vintages before we can say this. After more than an hour, the 62 is even fresher than it was at the beginning… And this is something worrisome, because it leads me to wonder if the more recent wines, made with oak as opposed to chestnut, and, more importantly, fruit that was likely riper (in 1962 winemaking was quite empiric) will hold up as well as it has. Quibbles, truth be told, because if I had a bottle of the 1988 I wouldn't sit on it for another 26 years to find out. The tasting ended with much animated conversation; for logistical reasons the Bianchis divided us into Italian and non-Italian speakers, and I went with the Italians, most of whom (me included) were bowled over by the freshness of the 1962, and also much impressed by the 99, which is cut from the same cloth but in a more modern key. The non-Italian speakers, I was told, were perhaps more impressed by the 99. It was in any case a most impressive tasting; the standard was universally high, and allowing for improvements in agronomic and winemaking technique, the wines displayed a degree of continuity from vintage to vintage that isn't anywhere near as common as one might expect. Wines to think about, remember, and perchance dream about. A few more pictures from the tasting. This speaks Paolo Conte, referring to the area around Broni and Stredella, known by many as the Oltrepò Pavese. If the six o'clock happens to be on a summer afternoon, with a muggy 95 in the chade, the picture changes. 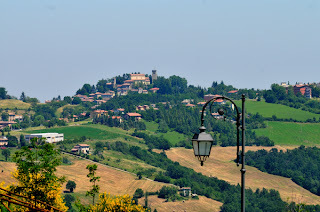 Then the fog is called heat haze and towards dinnertime you look for a place in the hills, thus discovering that the Oltrepò has a great many of them. From broni they tell us to climb towards Canneto Pavese and stop to eat at Bazzini's. Perhaps it's the Tuscan last name, or it may be the road winding among the vineyards, or the landscapes, but I start to feel hungry; the idea of dining in this restaurant, opened in 1940 seems better and better. 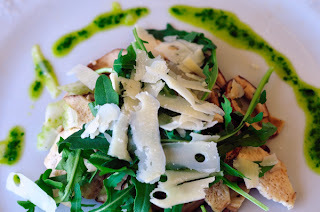 Canneto pavese is a small town, and it's therefore easy to find Bazzan's: It's right in front of the other local landmark, a church with a huge bell tower. Bazzani's is in a neat two story building with a number of halls, and a terrace with views beautiful enough to make the heart throb. It's not luxurious, but the tables are nicely set, and the (plastic) chairs have cushions. In short, here they cut to the quick, as you'll realize from the few dishes listed in the menu (some actually rather obvious), from the one waiter, who looks as if he was born between these walls, and from the behavior of the brothers who own the place: One is a showman, and the other silent, but both know how to make one feel welcome. In short, the views from the terrace made my heart throb, while my stomach was already throbbing; nothing left to do but order. My companion is rightly tempted by the fried frog's legs (a fine choice, perfectly fried and quite tasty), by the agnolotti with braised meat sauce (good), and by the snails (not at all bad, but not a summer dish), whereas I start with cold cuts and some excellent pickles, followed by something one can't pass up upon finding it on the menu: Chilled minestrone with rice! The portions are over the top, but everything is so good that the dishes go back as empty as my pockets. At his point satiation sets in and you let your guard down -- just in time to see the next table receive two cotolette alla Milanese of such glory one might want to marry them. First of all, meat with the bone, breaded and fried purely in butter, they're close to two fingers thick and I certainly admire them. My companions egg me on but I resist, promising myself a second visit. 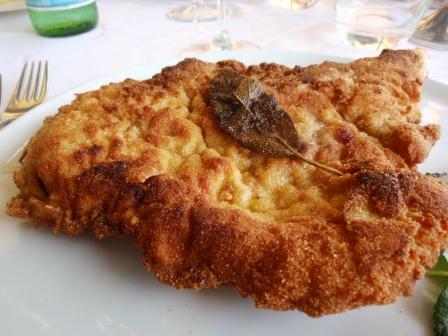 A promise kept a couple of days later, at lunch, when I order the cotoletta and, as Commissario Montalbano might say, go to town. I realize I haven't said a word about the wines. There isn't a list per se, but one needs only look at the racks of local wines in the entrance and the problem is solved: Crausé and Bonarda, the latter alas a little warm, until a family-sized ice bucket appeared and chilled everything. The prices are pretty cool too: 25-30 Euros plus wine, and for that you also get the views and the atmosphere of another time. Getting to the town of Zocca from the high plains of Mocogno was difficult: one switchback after another leading down 1300 meters from the the plains to the sea, and then another 750 meter climb to Zocca. Obviously, if you're coming from elsewhere, say Modena, you need not follow the path I had to. Zocca, or "block of wood" (what zocca means in dialect), is an attractive town, and is where Punto Radio, one of the first independent Italian stations, began transmitting in 1975; among the station's frist supporters was Vasco Rossi, now one of the great names of Italian rock. Those who know him well will also remember Massimo Riva, the guitarist and composer who left us all too soon, but had time to play with him in the 80s, and also wrote some of his most popular songs. 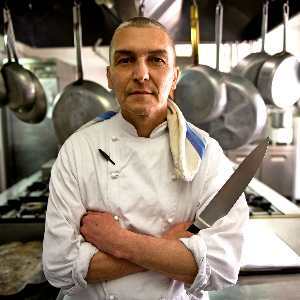 We are not here to talk music, however, but rather something more material: Food, good, rigorously traditional food. Zocca indeed boasts one of those places that only locals know how to find: No signs, and hidden from the rest of the town, on Via M. Mesi (Mauro Antonio Tesi, known as Il maurino, painter, engraver and architect); you'll only see it upon coming around a bend to the left. Of course finding it isn't that difficult; one need only ask, and everyone knows where the Osteria del Sole is. They also know it's a place one can eat well without being plucked like a chicken. It's Saturday, June 16, and very hot; I have an appointment with Arianna fugazza, a painter from Ferrara known for her airbrushing, and her friend Ilaria, but I get there first and take advantage of the opportunity to tour the town, admiring the pretty parish church (being restored, alas) and meet Francesco Ricci, a wonderfully cordial man who immediately makes me feel at home. He oversees the hall, while the kitchen is managed by Andrea Nocetti, from Modena…. Despite the stereotype that holds women incapable of being on time, my companions arrive a few minutes early: I can't go into the reasons for this meeting, but can say the technique Arianna has mastery over fascinates me and there is a project that will, sooner or later, come to light. 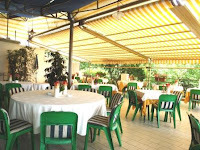 Or subject here is the Osteria del Sole, which deserves the attention. In reading the menu we discover that all the ingredients are local, from small producers: the Parmigiano, Tasone, Ricotta, Butter and Mascarpone are from the Caseificio di rosolo di rocca cheesers, who are working with some of the historic farms to recover the ancient Modenese breed of cattle, and use its milk exclusively in their parmigiano. The pasta, fried breads, and baked goods are made from organic flours from the Fratelli Mesini's organic farm, once again in Rosola di Zocca. 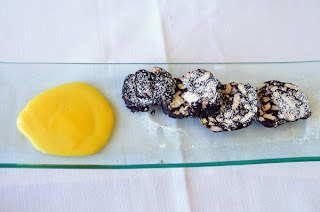 In particular, they use soft wheat flour from the Marzotto cultivar (a cultivar grown in the Appenino Modenese that had almost gone extinct, whole wheat flour, corn meal, and chestnut flour that are all stone-ground. The pork and pork cold cuts are from the Mora Romagnola pigs (a Slowfood presidium) rasied and worked by Cà Lumaco, an organic farm in Montetorte di Zocca. The salt is sweet sea salt from Cervia, another Slowfood presidium. The fresh pasta is of course hand-made. This sound like enough? And here are some of the dishes we enjoyed: A scrumptious, intensely flavored porcini mushroom carpaccio; Tortelloni with Ricotta from Rosola and Radicchio Trevigiano, perfect tagliatelle with locally picked mushrooms, and a juicy, well thought out pork fillet with wild radicchipo, strawberries and balsamic vinegar, all accompanied by a fine unfiltered Pignoletto Classico from Orsi San Vito, an organic winery (the wine list is correctly and exquisitely local). As we had no intention of passing on dessert we left space for an irresistibly delicious Crema Catalana and a magnificent chocolate salami with Mascarpone cream. The cost? 90 Euros for three people. Eating this well in a clean, welcoming in that also offers magnificent views doesn't happen every day. Our meal certainly merits another visit. Rosanna Ferraro has a delightfully impish smile, and is blessed with a sly sense of humor, as I discovered in the course of last year's Pellegrinaggio Artusiano. She also has a fine feel for what's distinctive in wine, and this year assembled a group of winemakers from Italy's many smaller islands. People who are dynamic and devoted to their craft, but due to the physical limitations of only being able to work that much land, would be overshadowed if they simply presented their wines along side those from the larger islands, or worse yet the mainland. Though the wines are from places that are in some cases geographically very distinct, Rosanna says that in tasting though them she found similarities she attributes to similarities in the environmental conditions on the various islands, the influence of the sea, for example. And I think she's right; they do display similarities, and even share a distinctiveness that comes from being primarily made from strictly indigenous grapes whose character does come through, influenced and supported by the sea and the terroir. I have often said that Italy is a great place for lovers of particular and distinctive wines, and Italy's lesser isles are the place to go for those whose take this love to extremes. Because they will find mush to get excited about. Pale brassy white with greenish highlights and white rim. The bouquet is elegant, with heather, sea salt and spice mingled with some cut green apple, slight passion fruit, and hints of bazooka Joe gum, with underlying granite. On the palate it's fresh and fairly lively with nice spicy minerality laced gunflint supported by passion fruit and some sour green apricot that comes to the fore, flowing into a long mineral green apricot finish that is balanced by slight sweetness. 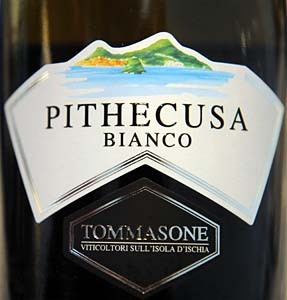 Pleasant, and very fresh; it will work well with fish, and also with white meats. Brassy greenish gold with brilliant brassy reflections and green highlights. Charged. The bouquet is fairly intense, with minerality and green apricots laced with butterscotch and some vegetal notes. On the palate it's fresh, and rather languid, with pleasing savory minerality and some gunflint supported by mineral acidity and some butterscotch, which flow into a clean butterscotch laced savory finish with some gunflint. Pleasant in a more languid key, more of a sipping than a quaffing wine, and it will be nice with fish. Pale brassy gold with brilliant greenish reflections. The bouquet is fresh, with sea salt and some quite green apricot mingled with slight gunflint and spice. On the palate it's equally fresh, with pleasing minerality supported by savory notes and peppery spice that confers a slight feeling if petillacnce, and flows into a fairly long savory finish that brings struck granite to mind. Quite refreshing in a distinctly mineral key, the sort of wine one can set out and drink; with fried meats or fish and vegetables it will be perfect. 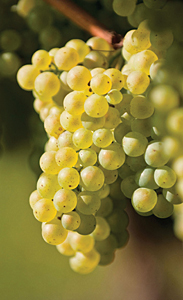 Forastera is a varietal introduced from the mainland in 1850; in Italian the word forestiero means (when applied to people) "not from here," and it works for varietals too. It's a single vineyard wine. Charged greenish gold with brassy reflections and greenish highlights. The bouquet is delicate, with minerality and some white berry fruit mingled with spice and slight butterscotch. Deft. On the palate it's mineral, with a fairly intense gunflint underpinning with hints of smoke, and flows into a fairly long mineral finish in which the gunflint carries. Minerality in a glass and refreshing, a food wine that will work well with grilled fish, and that also has the bitterness necessary to complement oysters and shellfish. It's a little more demanding than some. Casa D'Ambra Ischia Per'è Palummo DOC 2010Lot not apparent. Garnet with black reflections and ruby highlights, and slight brownishness on the rim. The bouquet is fresh and quite floral, with sweetness and violets mingled with slight sandalwood and some underbrush, with additional savory accents and warmth. Pleasant, and as it opens some cut flower pungency also emerges. On the palate it's fairly light, with bright floral accents -- It's like chewing violets supported by considerable bitter graphite shavings and gunflint minerality that carry into a very bitter finish with floral notes. It's a far distance from things like Merlot, and will be pleasant with red-sauced pasta dishes, quickly grilled meats, and similar. Quite interesting, and if you like wines that are distinctive it's something to try. Note: Per' è Palummo means "the dove's foot" in Neapolitan (a palummo is a dove), and refers to the shape of the bunch stem. Wanting to say it in Italian, it would be Peduncolo Rosso. Brilliant slightly greenish brassy white with golden reflections. The bouquet is mineral with some dusky accents, and some acidity; it gives an impression of holding back. On the palate it's ample and rather languid, with warm eucalyptus-laced lemony fruit with slight licorice root bitterness that carries into a fairly long, fairly bitter licorice root laced finish with underlying savory notes. Pleasant as a food wine, and will work well with both fish and white meats. Pale brassy gold with brassy reflections that are rather green. The bouquet is moderately intense with some savory notes and sea salt laced with minerality and hints of heather, with some mineral acidity too. On the palate it's bright, with gunflint laced savory lemony fruit that flows into a clean rather mineral finish. It's quite direct and will drink well as an aperitif or with fish. Deft in the context of the style, and will go quickly. Brownish garnet with brilliant brownish reflections and rim. 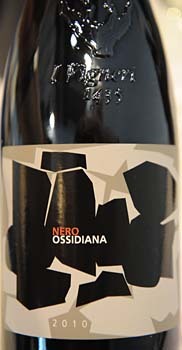 The nose is quite typical, with very sweet red fruit supported by sandalwood and some greenish accents, considerable graphite shavings, and a fair amount of alcohol -- it seems like more than the 14% indicated on the label -- and as it opens mentholated accents and quinine. A lot going on. On the palate it's ample, and sweet, with rich licorice root laced quinine and candied red fruit supported by a sandalwood-laced tannic underpinning that flows into a very long finish. A classic Aleatico, and if you like the wine, which is rather particular, you will enjoy it very much. It's one of those wines one hates to pour out at at tasting. 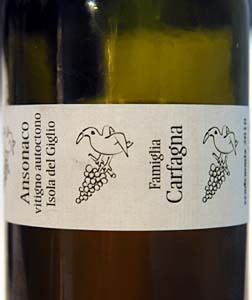 Antiche Cantine Migliaccio Fieno di Ponza IGT Lazio Bianco 2011Lot not apparent. Brilliant brassy yellow with brassy reflections and white rim. The bouquet is tart, with greenish vegetal accents and very green apricot supported by some licorice root bitterness and white blossoms. 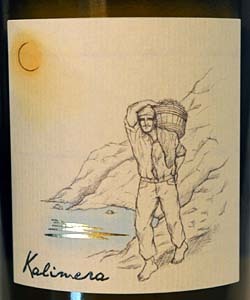 The palate is bright and fairly bitter with sea salt and gunflint minerality that flow into a fairly long rather bitter slightly tannic finish. Bracing, and will be very nice with grilled or fried fish or white meats. Expect it to go quickly. 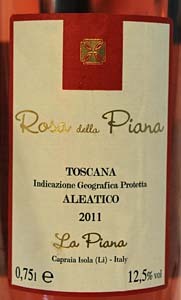 Antiche Cantine Migliaccio Fieno di Ponza IGT Lazio Rosato 2011Lot not apparent. Onionskin with brilliant copper reflections and white rim. The bouquet is delicate, with pleasant floral notes mingled with red berry fruit and some violets, with strawberry and wild strawberry acidity. Refreshing. On the palate it's fresh, with strawberry fruit supported by brambly raspberry acidity and tannins that are light, with gunflint bitterness that flows into a clean rather bitter gunflint laced finish with a fair amount of sea salt. Quite refreshing and will drink nicely with simple summer foods -- the perfect picnic or cookout wine. Pale rose petal pink with brilliant pink reflections and white rim. The bouquet is delicate, with floral accents, wild strawberry, some strawberry acidity and slight sweetness; it's quite fresh. On the palate it's ample and bright with wild strawberry fruit supported by raspberry acidity and pleasant savory minerality that flow into a fairly long savory mineral finish. Quite fresh, and will be pleasant as an aperitif or at a picnic or cookout, and also has the acidity necessary for fried meats or fish. Brownish garnet ruby with black reflections and brownish accents on the rim. The bouquet is intense and sweet, with berry fruit and considerable sandalwood supported by quinine bitterness and moderate alcohol, and considerable graphite shavings. Quite a bit going on in a sweet slightly brooding key. On the palate it's sweet and rich, with fairly intense prune fruit laced with sandalwood and quinine bitterness, and supported by tannins that flow into a long bitter (as much as a sweet wine can be) sandalwood finish with plum fruit to balance, which fades into dry sandalwood laced tannins. Pleasant in a slightly more brooding key and will be perfect with flavorful cheeses or by the fire. Pale brassy white with greenish reflections and white rim. Pale brassy white with greenish reflections and white rim. The bouquet is fresh, with fairly intense minerality and heather cou0pled with some gunflint and white blossoms. On the palate it's fairly bright and quite direct, with considerable minerality that gains some depth from slight sour lemony acidity, while floral accents reemerge in the finish. It will drink nicely with grilled or roasted fish, and is a fine interpretation of the varietal. Brownish garnet ruby with brownish reflections and some brown in the rim. The bouquet is moderately intense, with savory notes and dusky greenish accents supporting quinine bitterness and some spice, with underlying hints of sandalwood and some stewed prunes. On the palate it's quite sweet, with more intense prune fruit that one finds in some Aleatico, supported by lemony acidity that confers brightness and by bitterness with quinine accents that flow into a long dried prune finish in which sweetness is balanced by acidity. Pleasant, and more interesting on the palate, where it shows considerable verve, than on the nose. If you like Aleatico you will enjoy it. Pale brassy white with brilliant brassy reflections and greenish highlights. The bouquet is savory, with considerable warm sea salt supporting lemony acidity and slight gunflint, with hints of bitter almond as well. On the palate it's just as savory, with considerable bitter minerality and a fairly long bitter mineral finish that does display hints of sweetness. It's pleasant in an up front key, and will work quite well with foods. This is a Vino da Uvte Stramature, or wine from extremely overripe grapes, and is 17% alcohol. Brilliant charged gold with gold highlights and reflections; it brings to mind the gold of Renaissance picture frames. The bouquet is intense and sweet, with sugars and some gunflint supported by floral accents, cut flowers,, some sea salt, and a certain floral pungency as it opens. On the palate it's quite mineral, with underlying richness that derives partially from sweetness, though there are other things going on, and flows into a long gunflint laced finish with some bitter accents that brings sherry or Marsala (or, for that Matter, a Sardinian Vernaccia) to mind, coupled with lasting warmth. It's a bit extreme, and something you should only consider if you like this sort of wine. Demanding too, and if you are looking for something to simply sip without thinking overmuch, it's not for you. Dusky garnet ruby with black reflections and some orange in the rim. The bouquet is moderately intense, with savory red berry fruit supported by some bitter notes and some gunflint, with underlying sea salt. We're far from the French varietals here. On the palate it's medium bodied and rather dry, with moderate sandalwood laced berry fruit supported by bitter minerality and some spice -- there's more bitterness than acidity -- and it flows into a clean bright sandalwood laced mineral finish. The tannins and sandalwood overshadow the fruit, and as a result it will work best, assuming you like the style, with grilled or roasted meats, including fattier cuts. Brilliant gold with golden reflections shifted towards apricot, and white rim. The bouquet is interesting, with white raisins and some minerality coupled with slight oxidation. Very old style, and as it opens there is also brown sugar; it's rather welcoming, in a sweet key. On the palate it's ample and languid, with warm mineral laced white berry fruit supported by gunflint minerality and savory accents, with some licorice root that gradually emerges. Old style, and if you like that you will like it. If your tastes are more modern it won't work as well for you. Slightly brownish garnet with black reflections and garnet rim. The bouquet is fairly intense, with sour berry fruit supported by some quinine, licorice root, slight hazelnut, sea salt, and some savory sandalwood spice. Again, it feels old style. On the palate it's medium bodied and fairly bright, with berry fruit supported by moderate mineral acidity and tannins that flow into a fairly long rather bitter finish with hazelnut accents. Old style, with a bit of oxidation, but nicely done, and though it is more particular than most wines, if you like the style you will enjoy it. Pale brassy yellow with greenish brassy reflections and white rim. The bouquet is fairly intense and savory, with greenish mineral accents and some spice. On the palate it's bright, with lively savory lemony fruit supported by pleasant acidity and gunflint minerality that flows into a fairly long savory mineral finish with a slight flinty burr. Quite pleasant and will drink well with grilled fish or even white meats. Expect it to go quickly. Deep garnet with black reflections. The bouquet is intense, with jammy prune fruit supported by balsamic notes, some hazelnut, some sandalwood, and a fair amount of graphite shavings inter,aced with alcoholic warmth. Quite a bit going on. On the palate it's light, with bright berry fruit supported by sandalwood laced tannins and moderate mineral acidity that flow into a fairly long mineral finish. It's pleasant and graceful but particular; if you like the smoother, softer fruit forward international style it won't work for you. But if you like scrappier wines you will enjoy it. This is from Ischia, and is a non-vintage wine. No lot either. Tawny yellow with slight greenish reflections and brilliant gold highlights. The bouquet is powerful, with some sweet accents mingled with minerality, honeydew melon , savory notes, and sunlight. Quite rich in an opulent, almost Baroque key, and with more swishing sea salt and hints of onions also emerge. Quite a lot going on. On the palate it's sweet, with moderately intense apricot fruit supported by apricot acidity and some savory accents that flow into a fairly long sweet savory finish. Particular, and sweet but not really sweet; if you like the style you will enjoy it. This is a Passito di Pantelleria DOC, and is tawny gold with brilliant greenish gold reflections and white rim. The bouquet is full and sweet, with raisins balanced by sea salt; it's like sticking your head into a bag of Zibibbo raisins by the sea. On the palate it's sweet, and lush, with elegant Zibibbo fruit supported by green apricot acidity and flows rather quickly into a savory apricot laced finish with some apricot acidity. Luscious, and voluptuous, though not quite a starlet in a glass. A wine to sip with piquant cheeses along the lines of Roquefort or Gorgonzola Piccante, or far from the table.